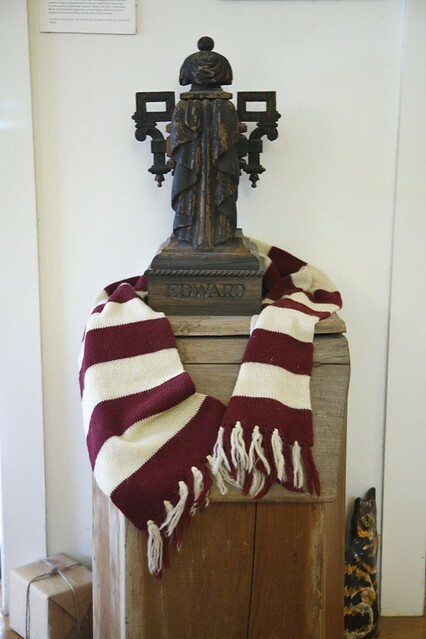 My boyfriend and I finally made a much-anticiated pilgrimage to the wonderful Edward Gorey Museum in Yarmouth Port, Massachusetts a few weeks ago. We were far from disappointed by what we found! 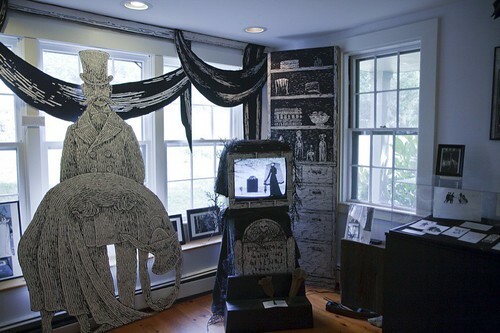 The museum (see photos above) is located in the home of the recently deceased author/illustrator/eccentric Edward Gorey. 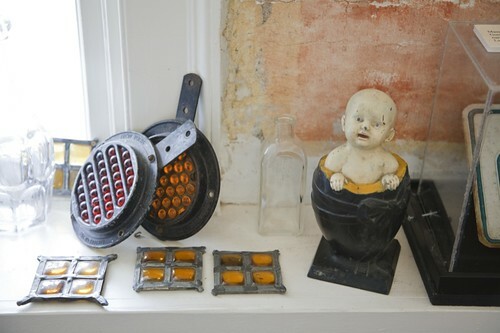 The home has, sadly, largely been cleared of Gorey's legendary clutter--though a few tantalizing fragments from his private collection can be found scattered about--and transformed into a compact house-museum dedicated to the man's life and work. 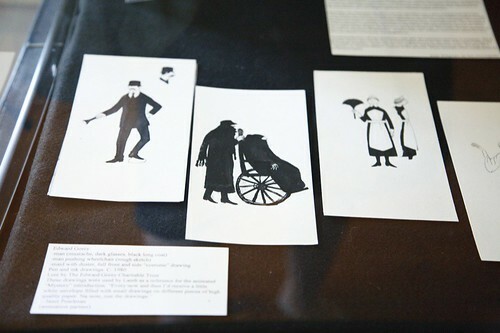 Part of me wishes they had simply left the place as it was at Gorey's death, and allowed visitors the opportunity to wander around the famously idiosyncratic environment in which the man produced so many of his iconic works. However, I was quickly won over by the museum's small-town- quirky charm, and the pretty great displays, which included original drawings and half-finished inked works, reproductions of his sketchbooks, amazing ephemera and souvenirs from Mystery and his Broadway production of Dracula, one of his raccoon fur coats, many of his Doubleday book covers, a number of his handmade stuffed animals, many coveted rare works such as his fantastic peepshow, and scores of other artifacts. 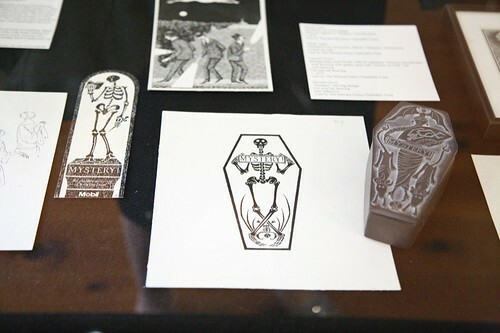 The gift-shop was also seriously incredible--with scores of Gorey-themed souvenirs I had never seen before--and the folks running the museum were lovely to talk to, knowledgeable and passionately devoted to the man and his work. 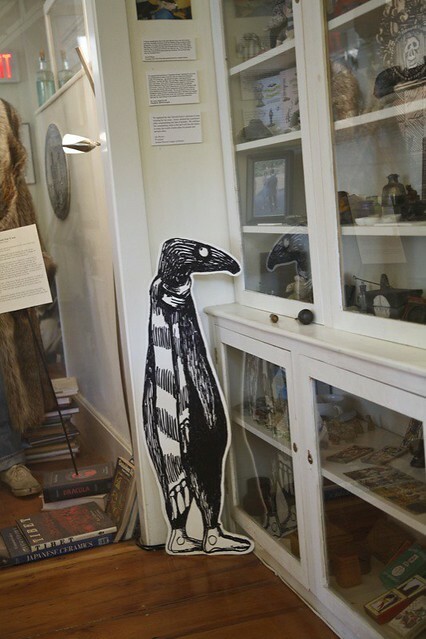 In all, the museum really managed to capture the atmosphere and spirit of Edward Gorey's peculiar and alluring universe, with all its whimsy, quirkiness, and elegance; one gets the feeling that Edward Gorey himself might almost have approved, if he had been capable of approving of any museum devoted to his own life and work. 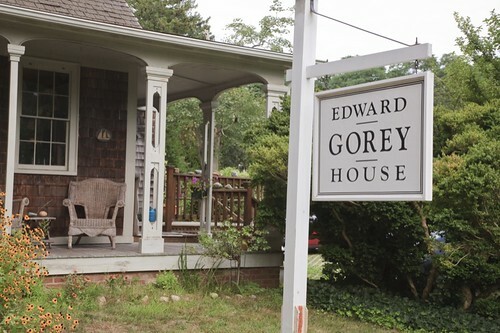 If you are a fan of Mr. Gorey, I cannot more highly recommend making a pilgrimage of your own to the Edward Gorey House Museum. You can find out more about it--including hours and directions--by clicking here; you can visit their awesome gift shop by clicking here. If you would like to make a virtual visit, you can view the full set of photos documenting my own trip--from which the sample above is drawn--by clicking here. Wonderful, thanks so much for sharing! On my list of must-see attractions. Thank you for the virtual tour! Fabulous! 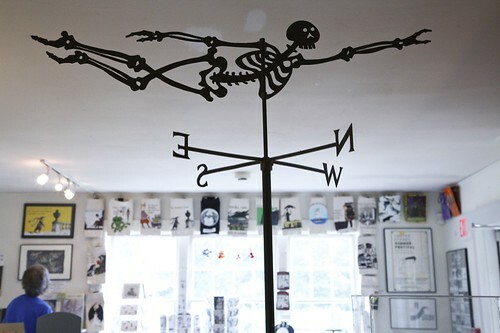 Really, how cool is Edward Gorey??? i think i may use his Christmas cards this year....totally out of the ordinary! Thank you for the tour...on to the Mutter? Oh I just love this! I can't wait to see it for myself. I'm especially curious about his own handmade dolls and stuffed animals. You all might enjoy watching it! 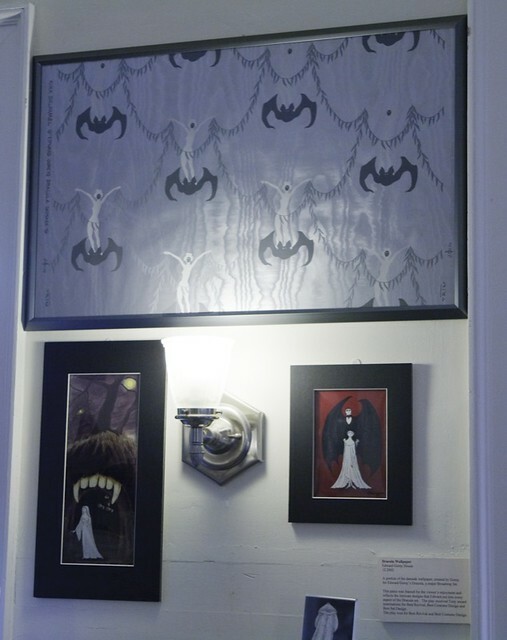 I just recently visited the Edward Gorey House, too. 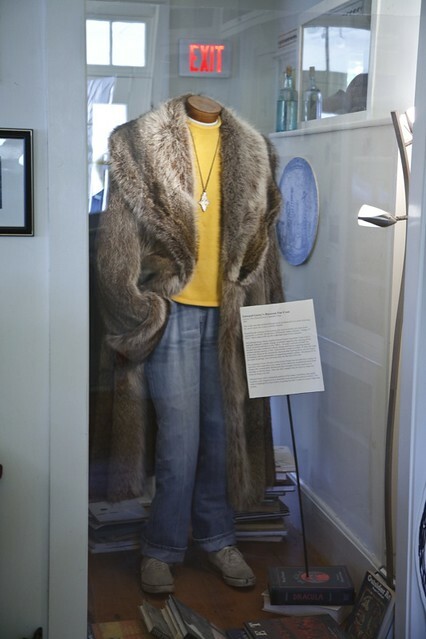 Although it really is just a mere glimpse into the man's life, it was great to see all that was on display. Our docent told us that Gorey loved to watch TV shows like Golden Girls, Petticoat Junction, and Buffy the Vampire Slayer (cool!) while he sewed his stuffed animals. He used to fill his hand-sewn figures with conventional rice, but hated going to the kitchen during the commercials, so he switched to Uncle Ben's which he could keep nearby and was a lot neater since it came in a box (that's what our docent said!). The EGH is definitely worth visiting, and the main exhibit changes once a year (I believe). And Ombledroom is worth seeing in person too. I've never seen a cat that large! Thanks for this great post. Hope I can see the museum some day. My parents gave me a book of The Gashlycrumb Tinies when I was five (trying to tell me to behave?) and I've been a fan ever since. I taught myself pen shading by copying his backgrounds.